The Joy of Ahimsa. Takhat Vilas. Mehrangarh Fort. Jodhpur. The Messenger, Purana Quila, New Delhi. Light of the World, Zanana, Nawalgarh. Life after Death, Mandore Gardens. Conqueror of the World, Podar Haveli, Nawalgarh. The Maharaja's Apartment, Udaipur City Palace. The Courtyard Conference, Dungarpur Palace. Avatars of Devi, Zanana, Samode Palace. A Place like Amravati. Udaipur City Palace. Solitude of the Soul, Udaipur City Palace. The Witness, Humayun's Tomb, New Delhi. The Holding of Vigilance, Samode Palace. Julius Shulman. Case Study House #22. Los Angeles. 1960. Evelyn Hofer. Radio City Music Hall Ladies Room. 1978. Evelyn Hofer. Andy Warhol & Liz. New York. 1965. Abelardo Morell. Sea in Attic. 1994. Abelardo Morell. Central Park looking Northwest. New York City. 1999. William Eggleston. UNTITLED (BATHROOM WITH PINK CURTAIN, CUBA) 2007. William Eggleston. UNTITLED (RED LIGHTS ON BLUE CEILING, HOLLYWOOD, CALIFORNIA.) 2001. William Eggleston. UNTITLED (BLACK SOFA). 1974. William Eggleston. UNTITLED (RED BARBER CHAIR). 1974. Candida Hofer. Palais Garnier Paris XXVIII. 2004. From the 1980's onwards, Knorr's work has been increasingly engaged with examining issues of power that underlie cultural heritage. This is the principal theme of her work but one that lies subtly under the visual richness and inventiveness of her images. Knorr's photographs satisfy many of the requisites of traditional photography which address the surface appearance of a species or place, but then move to a paradoxical space where they begin to question the overt assumptions of the picture's content. In "India Song", her most recent work, Knorr's photographs engage two formal constants - first the insertion by digital means of the animal subject(s) within the consistently frontal interior photograph and secondly the pose or action expressed. Each finished photograph is both a mystery and a fable – referencing both the vast tradition of picturing animals in art along with the western appreciation/appropriation of eastern culture and form. Like the pioneering early photographers who found in India a wealth of exotic subject matter, Knorr celebrates the visual richness found in the myths and stories of northern India using sacred and secular sites to highlight caste, femininity and its relationship with the animal world. She considers men's space (mardana) and women's space (zanana) in Mughal and Rajput architecture be they in palaces, mansions, or mausoleums. These interiors are meticulously photographed with a large format analogue camera. Knorr's own photographs of live animals are then inserted into the diverse rooms and sites, fusing high resolution digital with analogue photography. The results create original and stunning images that reinvent the Panchatantra (an ancient Indian collection of animal fables) for the 21st century and further blur the boundaries between reality and illusion. 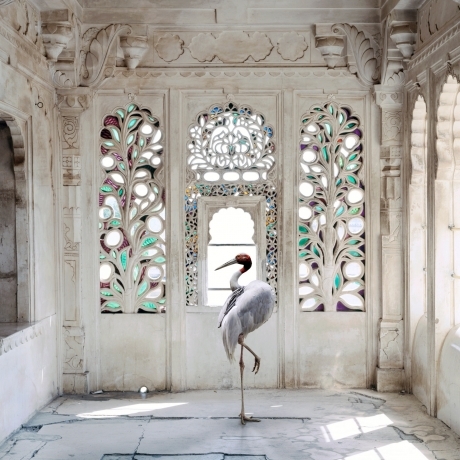 Although widely exhibited in Europe and India, "India Song" will be Karen Knorr's first solo show in the United States. This past October, the work was nominated for the 2012 Deutsche Börse Photography Prize - Europe's most prestigious award "for a living photographer who has made the most significant contribution to the medium of photography over the past year". In addition to Knorr's work, the back gallery will present a selection of photographs of interiors by Julius Schulman, Evelyn Hofer, William Eggleston, Candida Hofer, Robert Polidori, Abelardo Morell, and Matthew Pillsbury.